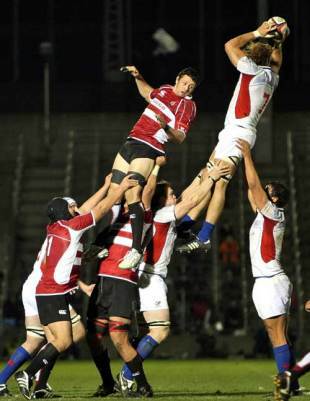 Japan made history Saturday by beating the United States for the second straight time, winning a hard fought encounter at the Prince Chichibu Memorial Ground 32-17. It was the first time in 18 meetings that Japan has recorded back-to-back wins over the Eagles and left coach John Kirwan a happy man. "I am very, very proud of the players," Kirwan said. "We talked about history and beating them in consecutive games. That was a really tough physical and mental performance." Kensuke Hatakeyama, Koji Tomioka, Shaun Webb and Takashi Kikutani all crossed for Japan, with Ryan Nicholas adding three conversions and two penalties. The Eagles' points came from tries by Chris Wyles, Takudzwa Ngwenya and John Van Der Giessen with Mike Hercus successful with one conversion. "It was an entertaining game," said Eagles coach Scott Johnson. "There were some good tries. If I was a spectator I would have enjoyed it. But I am a coach so I didn't." The Eagles got off to the ideal start with Wyles crossing with just two minutes on the clock. Japan fought back, however, and Hatakeyama finished off a superb driving maul to bring the sides level. The Japan backs then took over with Tomioka and Webb crossing following superb backline moves and Japan seemed to be in the driving seat. But Yusuke Aoki and Bryce Robins were sent to the sin bin within two minutes of each other and Ngwenya made the extra men count, sprinting over to make it 19-10 at the break. Nicholas opened the second half with a penalty before another historic moment - the first try in Japan to be awarded by the Television Match Official as Van Der Giessen won the race to touch down a charged down kick. Kikutani then showed just why he was picked as Japan's new captain. The flanker came into the line out wide and, following a slight show of the ball, sprinted over for the decisive try in the 63rd minute. "Kiku has really stood up and taken on the leadership role," said Kirwan. "This has been a really positive month for us."